Have I ever shared why I use the butterfly as my gravatar logo? Well, I saw my first butterfly of the season and it brought back the memory. It was approximately 32 years ago when my sister died in an accident in the desert of New Mexico. She was 17, beautiful, a believer, and very popular at school. I was in college at the time and my employer offered to pay for a plane ticket so I could be home for the funeral. After attending the funeral, filled with high-school friends and teachers, my Father and I decided to make the trip to New Mexico to salvage the truck which hadn’t been damaged much in the accident. The camper which my sister had been in had been crushed. As far as we know she died instantly. My brother was right next to her, never heard her, and miraculously made it out without more than a scratch. On that trip, I experienced the thing closest to Hell that I ever wish to encounter. First, I’ve never been hotter or more uncomfortable. We traveled from Southern California to the wrecking yard In New Mexico where we found the truck and began the long tow home. We stopped at a little café alone in the middle of the desert. The place was packed and the little air conditioner was trying to keep up with the heat coming off of the hot bodies that had found this only oasis. After this short and helpful break, we continued on through the desert. The heat was unbearable. We stopped in the middle of the most desolate place I’ve ever experienced. There was not a living thing in sight. My Dad and I were both exhausted. As we were about to resume our trip, from out of nowhere came a beautiful butterfly. The first thing that came to mind was a question: “How did you get way out here?” It must have been the only colorful living thing for miles. I won’t go so far as say that it was a “sign from God.” But, it was a reminder. I thought of the Bible verse that said that God would never leave me or forsake me. It gave me hope. That is why I use the butterfly. This entry was posted on Wednesday, March 19th, 2014 at 5:27 PM and is filed under Commentary, Creation, LIFE, Love of God, Words that Uplift. You can follow any responses to this entry through the RSS 2.0 feed. You can leave a response, or trackback from your own site. Beautiful Chris, thanks for sharing. I can identify with the most desolate place on earth. It is 29 Palms California. It is an artillery range for the Marines. a real armpit. I’ve been to 29 Palms but it was years ago. All I can remember was that it was very hot. I always enjoy your comments my friend. Thanks, Chris! I’m sorry that this sorrow was yours and your family’s. 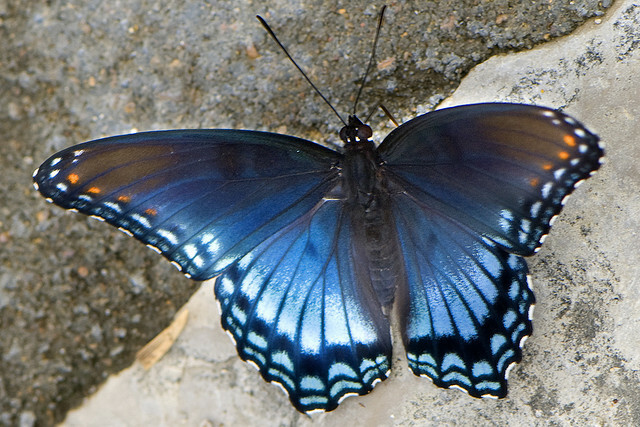 Yes, the butterfly is a kind of Creation and new Creation sign. Our Creator is so kind! Praise Him forever! You’re welcome, Maria. Thanks for your interest. As kindness is fruit of the Holy Spirit, I also think of God as kind and loving. He has had mercy on us and we are so undeserving. I will praise Him forever with you! So glad you will be, Chris!